The Club started in 1966 with some of these. Tyneside and Durham Branch at MG Northumbria, Corbridge. Some of the 1,400+ Cars at the Newby Hall Rally organised by Bishop Auckland Branch. Tyneside and Durham End of Season Rally at Beamish Museum. More Members Cars at Woodhorn Mining Museum. Durham Branch at Durham Regatta. North of England Classic & Pre-War Automobiles (formerly known as The North East Club for Pre-War Austins) was formed in 1966 by Tony Pelton. It is now the largest Historic Vehicle Club in the North of England with over 900 members. 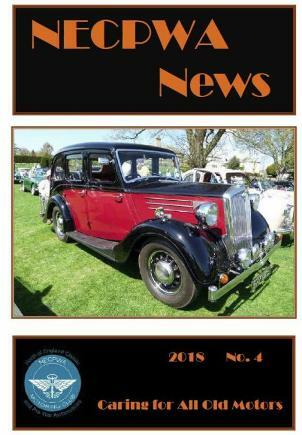 We are a member of the Federation of British Historic Vehicle Clubs and are now a multi-marque club, with around 25% of members owning pre-war Austins. The initials of the name NECPWA were so widely used, that when the 'Club' began to accept other makes the initials were retained by popular request, although informally we are now affectionately known as the ‘Nearly Everywhere Club for Pretty Well Anything’! Membership is open to any enthusiast of old motor vehicles and it is not necessary to be a vehicle owner to join the club, however attendance at Club organised rallies is generally restricted to vehicles built before September 2000. [NB each event has its own entry rules with stricter age limits]. The Club's aim is to encourage the restoration and regular use of all Historic Motor vehicles produced anywhere in the world. We do encourage the formation of Local Branches and currently have branches representing the following areas: York, Durham, Bishop Auckland, Tyneside, North Yorkshire, Carlisle & Cleveland. Local branches are responsible for running their own events, and have their own representatives on the Executive Committee. Our membership is spread over a very large area, mainly in the North of England and South of Scotland, we even have members overseas! Members come from all walks of life, united by a common interest. We are a non-profit making society with Honorary Officials. We are a member of the Federation of British Historic Vehicle Clubs which was formed in 1961 to represent the interests of the "Older Vehicle Movement" in the United Kingdom to Government Departments and the EEC on legal, technical, and general matters. We are proud of our friendly, informal outlook, and we hope that You will decide to join us, and keep those old wheels turning.